The calendar for 2018 is out and there are new races added to the calendar although the World Tour is unchanged. Here’s a closer look at the World Tour events for 2018 to see which are the busiest months and which countries get the most racing. Here’s the breakdown by month. The season opens with the Tour Down Under and since last year has the Cadel Evans Great Ocean Road Race too before the circus moves to the Abu Dhabi Tour in February. Viewed from the chart above it looks like January and February are covered but once the peloton quits Australia it’s four weeks before the next World Tour race and then a calendar clash with Abu Dhabi overlapping with the Omloop Het Nieuwsblad. Calendar clashes seem unusual in sport, especially for the premium calendar. 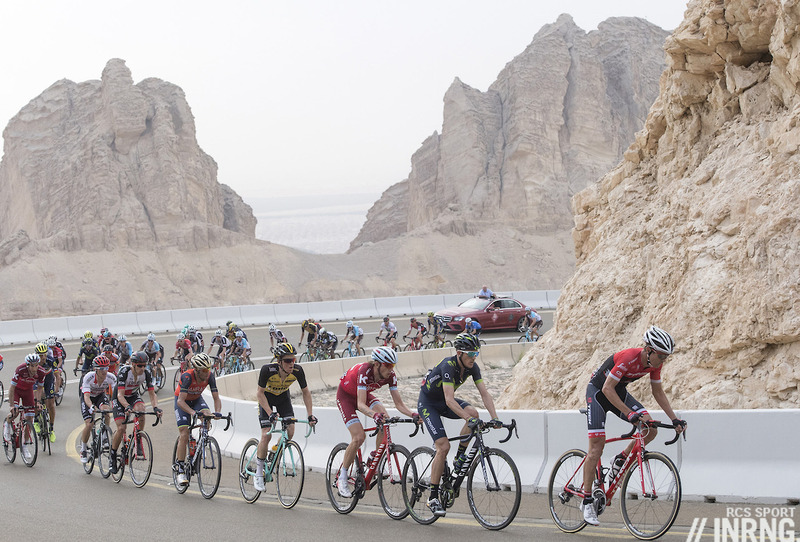 But pro cycling is unusual for its diversity, one portion of the peloton is at home on the cobbles of Flanders, another much happier to be testing themselves on the dry roads of Abu Dhabi, complete with a summit finish stage. What can confuse more is the later calendar clashes where events are in competition with each other, think Tirreno-Adriatico and Paris-Nice; the Critérium du Dauphiné and the Tour of Switzerland; or the Giro d’Italia and the Tour of California. Here it’s hard to know which race to follow but fortunately it’s possible to watch both although it means going from famine to feast in terms of media coverage. These calendar clashes and competition help explain why March is the second busiest month of the year in terms of World Tour race days. We may view this still as early season competition – and for plenty of participants races like Paris-Nice and Tirreno-Adriatico are preparation events to hone condition – but there’s a lot at stake in terms of wins and points. This chart shows where the races are although for the sake of clarity a grand tour counts towards the home country, for example the Giro is Italy rather than any days attributed to Israel in 2018. Having a grand tour means France, Italy and Spain have the most days of racing and in turn the greatest media exposure because these are races of national significance, the kind that feature on the evening news bulletins as well as live coverage for several hours. Switzerland is next thanks to its national tour and Romandie and if the calendar was being redesigned today perhaps this small but prosperous country would have fewer days even if it offers strategic Alpine tests. Next is cycling-crazy Belgium and then things tail off quickly. Stage races count for plenty with 158 days of racing compared to 20 one day races. As we can see the “World Tour” label is a little presumptive, there’s nothing in South America nor Africa and there’s only one Asian event, the new Tour of Guangxi. The “World Tour” label has gained a status and meaning, riders will use World Tour as a shorthand reference to the major races with the big teams and also for tactical control and fewer opportunities for surprise results. But several of the new events added in 2017 have diluted this, notably the Tour of Turkey which might have a WT label but attracted fewer World Tour teams in 2017 than it did in 2016, although a late calendar switch was partly to blame. But the label itself hides different ranking points and of course different status. Most long term cycling fans will know the implicit difference in the value of a stage win in the Tour de Suisse versus one in the Tour of Guangxi despite their shared World Tour label and this undermines attempts to ensure a harmonious calendar. It’s like a Formula 1 calendar where many teams and top drivers show up for, say, Monaco, but won’t travel to other races. This conservatism does give established events very strong roots and has perhaps allowed the sport to weather its doping storms because the major races are socio-cultural events as well as mere sporting contests but does mean that additions to the calendar still have to prove themselves for years before being accepted as fixtures but this is inevitable too given the time it takes to learn about the subtleties of each event. Finally if you’re wondering what makes a race World Tour versus other “HC” or “.1” status and so on, it’s a question of history and ambition. Legacy events like the Tour de France or the Tour of Flanders have a status that means they’ve been included since the start while other races can and have applied to join the top calendar and they must meet a range of criteria and pay higher registration fees to the UCI and as well as meeting these regulatory requirements it’s a subjective process where a race in a key target market for pro cycling, be in in California or Guangxi, is more likely to get approved than, say, a new stage race in Spain. There’s nothing revelatory here but it helps provide some numbers for the coming year. A World Tour? Sort of but this remains the preserve of France, Italy and Spain which share between them well over half of the number of days of racing and an even greater proportion of the TV audience. The calendar now runs from January to October but with peaks and troughs throughout and the status of the new races being unclear to fans, teams and riders it all looks a jumble rather than a consistent package. I still think it should be a good idea to plan a World Tour Race in cycling mad Colombia in January, after or before the Tour of San Juan. Agreed, in a perfect world, it’d be great to see a WT race in Colombia or Japan where you can imagine crowds lining the road instead of China or the Middle East where they evidently don’t care. From a UK-centric point of view it’d be great to have a WT race here in Yorkshire instead of London as well. There’s the “new” 2.1 stage race in Colombia in 2018, Colombia Oro y Paz (“Gold and Peace”) so if this is a success it could be added to the WT calendar in due course. It’s in February, the same time as the Dubai Tour and Nairo Quintana is planning to race it among others. That’s good news, hopefully it gets some coverage on Eurosport. You mention there’s only one Asian event in Guangxi, but Abu Dhabi is in Asia too. Most stages of the Tour of Turkey are also in Asia. What conservatism ? It’s rather history and traditions. Cycling is not popular in every country around the world and the weather conditions have to be taken into account. There is not so much confusion or overlapping either, nobody would race both Paris-Nice and Tirreno-Adriatico the same month because one is hard enough. And the UCI don’t have the power and the means to create races and to give prize moneys. Sticking to history and tradition= conservativism. The whole concept of the WT is badly considered and flawed, unless you take the literal meaning of the two words – World Tour ! Sporting ideals are simply being lost is a desperate attempt to follow and harvest the money, with little or no respect for the historic or competitive nature of bike racing. 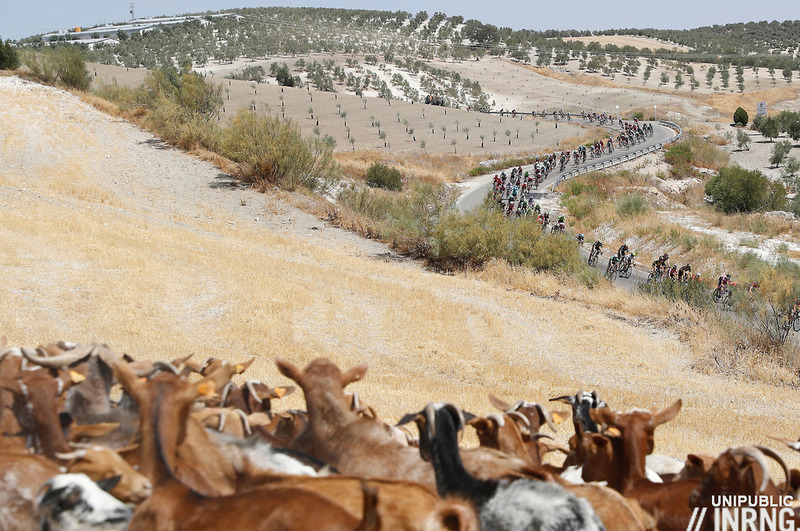 The UCI would be better advised to keep to its main remit of rules and regulation, rather than including some of the best bike races in the world in a mish mash of mediocrity. If the UCI kept to their main remit, maybe some of the endless and unresolved problems with pro racing – moto’s anyone, might be resolved. +1 “Heinie’s Folly” needs to be put to rest, just like its founder. Larry you know that we all knew that you would respond as you did. Football World Cup is only held in one country, and it’s still the World Cup, cause participants come from all of the world. So is it not World Tour unless the Antarctica race? I guess the thing, semantically, is that World Cup implies a global competition, whereas World Tour has an actual geographic implication of moving around throughout the world for races. I was curious to see how this compared with the Women’s World Tour which is less linked to a traditional calendar, especially with the absence of the Grande Boucle Féminine Internationale. Seems Netherlands has substantively more race days (9), Norway (4) and Sweden (2) have events, and France has only Plouay. Nothing in Switzerland, Australia or Poland. Heavily caveated of course, but interesting to see if (but more hopefully ‘how’) the Women’s Tour progresses as it might contrast with elements of the Men’s in being less about breaking new markets and more an organic progression about going where the interest is. It’s interesting because there’s more of a blank canvas or at least a lot of space on this canvas. The “Women’s World Tour” is a topic I want to address sometime soon because it shares the same label as the men but is really a copy-paste of the Continental set up, ie third tier but that’s for another day. Spain = 5 (4+1) – Welcome back Emakumeem Bira! What’s still missing in the top level are some historical stage races, some of them mainly because of the UCI (Gracia Orlova), others because of financial woes, essentially the French ones, some of which look gone for good (Tour de l’Aude), while Ardèche, Route de France or Trophée d’Or might someday step up with a little help. It’s a shame the Thüringen-Rundfahrt has no WWT status. This stage race for women was held first in 1986, which makes it one of the oldest stage for women at all. But maybe it wont get status cause the men have no stage race in Germany either. Inrng.com: I am baffled as to how you can ignore the biggest story of the off-season, namely the complete failure of UK doping authorities to draw any conclusions about whether Wiggins did or didn’t. I hope you aren’t holding back for whatever reason and that you have a piece in the pipeline. Let me give my two cents worth while I am here: Wiggins – whether you like it or not, the emphasis is on you, in the court of public opinion at least, to prove your innocence and tell us what was in that jiffy bag. If you can’t or you won’t you deservedly face a lifetime of innuendo and suspicion. I realise I’m probably in a minority here but I have to say I’m not really worried whar inrng does or doesn’t have to say on this. I’m sure if it is covered it’ll be as insightful and well written as ever, but it’ll be one of another thousand voices. Personally speaking I love reading inrng’s thoughts on subjects I’d never otherwise hear about – Japanese racing culture, unheard of mountains or features on Tours from past decades. So yeah, I’m sure another feature on the jiffy bag might be “deserved” from a news perspective, but this isn’t a news site. I’m probably in the minority on that though, I’m sure. This is one of the rare occascions when a comment of “+1” is entirely fitting and appropriate and worth the time it takes to read it. The Inner Ring is under no obligation whatsoever to cover every angle of (men’s) road cycling and it is perfectly in order for the Inner Ring to refrain from posting anything at all on any sparticular topic or angle, no matter how acute and important burning some or many of the readers consider the issue to be – and those readers have no reason and absolutely no justification at all to draw their own conclusions about the Inner Ring’s opinions or motives! Let’s enjoy what we have and what the Inner Ring provides us and let’s show our appreciation instead of sniping indirectly or directly. +3 Its not a news site and there are no demands for content! Didn’t Wiggins say it was fliumicil? I thought the conclusion was that no new facts have been unearthed? Surely it’s hard to write something that contributes anything new in those circumstances. All I will say, if it helps you in this off-topic moment, is that the benighted Sir Dave was courtesy personified. Of course he would hear my question, would be most pleased to do so. “Great”, I said, searching for my notepad (they have a habit of getting lost). “Hold on a jiffy, and I’ll be right with you.” Well the man’s demeanour changed in an instant: from warm to cold; from embracing to bracing; from welcoming to Piss Off. Sadly, I suppose he might be bi-polar. I hope he didn’t have such a funny turn when being dubbed – it could have been ticklish. But he can breathe easy: there are probably some good drug treatments if you can arrange the right medical advice: between a Monday and a Wednesday, obviously. I might cover it but it’s getting such widespread coverage that I’m not sure I can add much, especially with well-sourced journalists like Matt Lawton, Matt Dickenson on the case – go look up their reporting as it’s thorough. There was this from http://inrng.com/2016/09/wiggins-tue-sday/ and it could almost be copy-pasted again and there’s this too http://inrng.com/2017/03/sky-tue-epistemology-known-unknowns/ and the problem is that both of these posts say the story will drag on and on … and it still is. Mr(s). Ring, is the last paragraph incomplete?